A new Guatemalan ambassador has taken up residence in Belize, almost two years after his predecessor Manuel Estuardo Roldan Barillas was abruptly recalled. Roldan returned to a new post as Guatemala’s Vice Minister of Foreign Affairs amid heightened tension between both countries, following the shooting death of Guatemalan teenager Julio Alvarado Ruano in the Chiquibul Forest in April 2016. 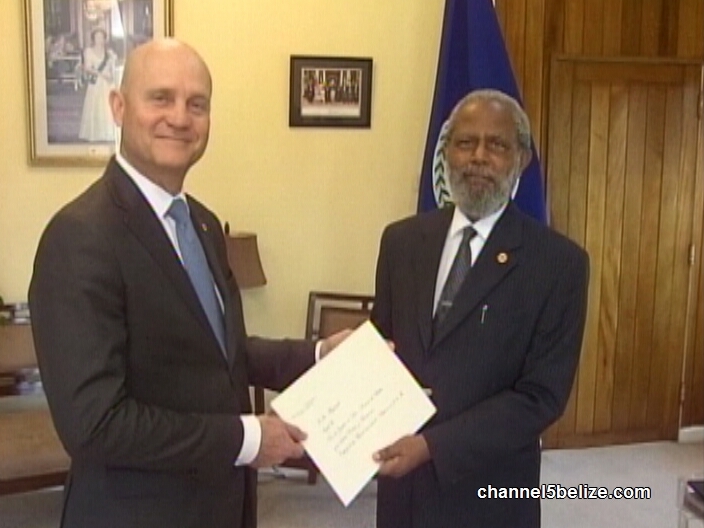 Earlier today, Georges de La Roche Du Ronzet called on Governor General Colville Young at the Belize House in Belmopan. Accompanied by a delegation, the former Director General of International Bilateral Affairs presented his Letter of Credence which was kindly received by the representative of the Crown. In his previous capacity, de La Roche was in charge of all diplomatic relations and issues with all of Guatemala’s embassies abroad, as well as all embassies accredited in Guatemala. His office was tasked with focusing on bilateral political consultations, development and cooperation, including commerce and cultural diplomacy.